The unique bond between Stone-Age man and quantum science has been proven by the recent discovery of how Stonehenge was constructed some six thousand years ago. This prehistoric civilisation was responsible for the construction of stone monuments such as Stonehenge where the latter-day Druids will gather on the Morning Summer Solstice on the 21st June this year, to witness the sun rising on the longest day. Little will they know that the stone construction that surrounds them was deliberately built to the exact dimensions of a mathematical shape known as a Hexagram? This constructional blueprint is well known to quantum scientists and biologists as it is the fundamental building block of nature and unique geometrical entities such as snowflakes and flower petals. 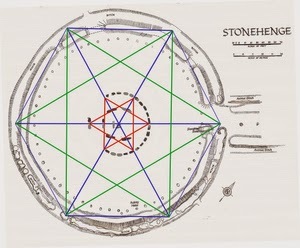 From bees' honeycombs, the Giant's Causeway and even the mysterious north pole on the planet Saturn, hexagonal patterns are prevalent in nature due to their efficiency, which like Stonehenge are based on a six sided construction made from perfect isosceles and Pythagorean triangles, commonly known as the golden ratio. Apparently an exhibition of Robert John Langdon's work, including prehistoric maps of Wiltshire and the South Downs and models of the original Stonehenge structure are available to view at: Ology, 12-14 High St, Rottingdean, Brighton BN2 7HR.